Mike Tyson: Undisputed Truth HD Blu-Ray. 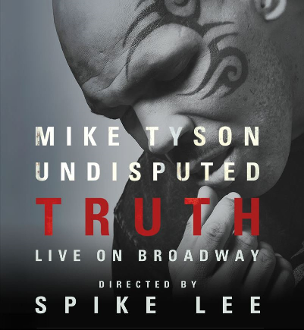 Mike Tyson and legendary filmmaker Spike Lee bring Tyson’s hit one-man stage show to TV in MIKE TYSON: UNDISPUTED TRUTH. Raw, honest, powerful and full of humor, the film features “Iron Mike” recounting his life’s highs and lows in his signature candid style. Over the course of 90 riveting minutes, Tyson opens up about his troubled Brooklyn youth, landmark boxing career, key influences in his life, personal and professional controversies, time in prison, loss of family members and, most recently, his rehabilitation and redemption, forged by sobriety and a renewed commitment to family life.